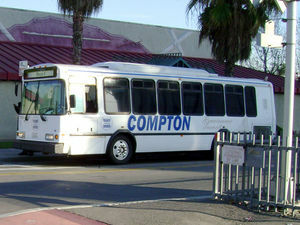 Compton Renaissance Transit provides local bus service in the City of Compton. All routes connect with LA Metro Blue Line at Compton Station. Weekday service ends around 3:30pm to 5:30pm depending on line. Saturday service begins at about 9am and ends by 3:00pm. No Sunday service. All lines are loop routes in one way direction only. This page was last edited on 6 December 2018, at 03:22.